Malvern Panalytical has a wide range of characterisation technologies that can be used to accelerate the drug development process. Its methods are used by scientists and engineers to maximise productivity and increase time-to-market. Through a range of high-quality, customer-focused characterisation services, Malvern Panalytical delivers cost-effective chemical, physical and structural analysis of materials for the indication of performance in drug products. Solutions range from tools that can run reliably and unattended, to systems that provide information on several key attributes in a single analysis such as particle size, shape, chemical identity, molecular weight, size, and concentration. Malvern Panalytical’s instruments are deployed across the pharmaceutical industry for discovery, development and manufacturing applications. Whether developing new, ground-breaking drugs or generic formulations, both the time and cost associated with pharmaceutical development is significant. In addition, work-flow efficiencies may be achieved when these tools are used in conjunction with each other. Malvern Panalytical is focused on providing well-designed, innovative analytical instruments, which follow the quality by design (QbD) ethos in the fields of drug discovery, chemical and formulation development, and pharmaceutical manufacturing. The company understands what is involved in the development and manufacturing of a drug product and the requirements to measure the critical material attributes (CMA), as well as critical quality attributes (CQA) affecting the critical process parameters (CPP) in the manufacturing process. High throughput screening of large libraries of chemical compounds is the dominant technique used in early stage drug discovery, with dynamic light scattering being the optimum tool. Being able to measure very small particle size at low concentrations, it is ideally suited as a screening tool for identifying even small levels of aggregation and potential inhibition. In order to monitor efficacy of the suspension accurately, administering trial drug candidates in this form requires accurate, repeatable and validatable control of the active ingredient’s particle size, often on limited sample volumes. Laser diffraction is the best tool to meet these pre-formulation requirements. This technique provides particle size distribution of nano-scale material, while also having a wide dynamic range. When characterising bioavailability or bioequivalence of nasally administered drugs, in support of new drug applications (NDAs) or abbreviated new drug applications (ANDAs), for nasal aerosols and sprays, the US Food and Drug Administration (FDA) recommends several tests. In cases where the active component or components are suspensions, one important attribute is the drug particle size distribution. A laser diffraction system fit for this purpose must be able to rapidly measure obscuration (optical concentration), in addition to changes in droplet size distribution and span in real-time over the life of a single actuation from the drug delivery device. The size of a liposomal vesicle plays a pivotal role in the pharmacokinetic and pharmacodynamics attributes of chemotherapeutic drugs, with the liposome acting as a carrier of the drug to the site of action and dynamic light scattering can be an effective technique. Triple-detection size exclusion chromatography (TD-SEC) can accurately characterise polymer excipient molecular size and weight and avoid incorrect determination. The conditions of a tablet coating process can be simulated using a rotational rheometer system. The viscosity of the liquid coating is measured initially under low stress conditions to quantify its full structure, then at high shear rates to simulate spraying, and again at low stress conditions to assess the viscosity rebuild with time. Granulation can improve the ease of handling of powder blends and prevents the segregation of fine constituents, improving consistency in subsequent process steps, principally tableting. To improve the efficiency of the milling operation, and deliver more consistent milled particle sizes, online particle-size analysis is a solution for continuous milling monitoring and control. In addition, measurements made by the online analyser can control the process through a closed loop with the mill’s programmable logic controller (PLC). Founded in the late-1960s as Malvern Instruments, Malvern Panalytical is now one of the world’s leading materials and biophysical characterisation companies. Having built on a long-established reputation for innovation in particle sizing, the company today is highly respected for its technology and applications leadership in areas that range from particle, protein and macromolecule characterisation through to rheological properties measurement and into process optimisation. Malvern Panalytical understands that when a customer chooses to invest in a Malvern Panalytical product, that customer is making a serious financial commitment. The company takes this seriously, and strives to ensure that the customer is reminded that they will receive exceptional and personalised support for the many years they will have Malvern Panalytical equipment. Please contact Malvern Panalytical with your business enquiry. Malvern Panalytical has announced the next set of webinars for the November and December period, including a particle size masterclass, ‘Using Rheology to Characterise Asphalt for Roofing Applications’ and 'Major Advancement in the Elemental Analysis of Metal Sulfides'. If you are interested in attending any of these events, please make an enquiry using the form on this page. This white paper explores a number of ways that today's modern, laboratory-based powder x-ray diffraction (PXRD) instrumentation and advanced software can greatly assist pharmaceutical scientists in their quest to develop high-quality, stable products and accelerate their speed-to-market. Insitec systems provides continuous online analysis of particle size analysis, ensuring economical, efficient monitoring of industrial processes. Kinexus is a next-generation rotational rheometer platform, developed according to industry feedback. The Mastersizer range comprises easy-to-use, accurate and reliable particle size analysers. OmniSEC software is an integrated solution for advanced analysis of proteins and polymers by GPC/SEC, and is essential for Viscotek systems and detectors. Malvern Viscosizer TD is an automated biophysical characterisation tool that uses Taylor dispersion analysis to provide ultra-low volume, solution-based molecular size and stability measurement capabilities. The Viscotek range comprises of complete systems, software and detectors, which are all supported by Malvern's worldwide network to provide training and advice. The Viscotek UV detector is sold to complement the Viscotek TDAmax, which completes a tetra detector format. Morphological imaging is fast becoming an essential technology in the laboratory toolkit for particle characterisation. Malvern Panalytical's Zetasizer AT brings the dynamic light scattering (DLS) technology of the Zetasizer Nano to the process development and manufacturing arena, enabling real-time monitoring of nanoscale particle processes online. Malvern' Zetasizer series measures particle and molecule size from below a nanometer to several microns using dynamic light scattering, zeta potential and electrophoretic mobility. MicroCal DSC microcalorimeters are powerful analytical tools for characterising the stability of proteins and other biomolecules, requiring minimal assay development, no labeling or immobilisation. The automation and high sensitivity afforded by MicroCal VP-Capillary DSC systems permits screening of large numbers of samples at low concentrations minimising the consumption of valuable samples with little hands-on effort. Differential Scanning Calorimetry (DSC) measures the heat change during denaturation of biothermal samples, particularly engineered proteins and biopharmaceutical products. This presentation provides an overview of gel permeation chromatography (GPC), including what it is and some common applications. It then explores chromotography, the analytical technique that provides the foundation for GPC. This white paper provides a general introduction to X-ray Fluorescence (CRF) spectrometry and XRF analysis. It explains how a spectrometer works and how XRF analysis is achieved. The following list gives a definition of a number of terms, with notes on their specific use in the context of dynamic light scattering. Omnian was developed for Malvern Panalytical's high-end x-ray fluorescence (XRD) spectrometer and is also available for the Epsilon 4 energy dispersive x-ray fluorescence (EDXRF) benchtop systems. This powerful combination brings together the strengths of Omnian with the ease-of-use of Epsilon 4. European Molecular Biology Laboratory (EMBL) is developing a new facility within the Barcelona Biomedical Research Park (PRBB) campus in Spain. Malvern Panalytical has announced its latest set of seminars for the November/December period, including a NanoSight workshop, an OMA user day and a DLS Workshop. If you are interested in attending any of the events or have any questions, please make an enquiry using the form on this page. Malvern has announced a series of seminars taking place throughout September and October. If you are interested in attending any of the events and have any questions, please make an enquiry using the form on this page. Malvern Panalytical has announced its next batch of webinars this month. Liposomes are nowadays frequently used as drug delivery systems, and as such requires that they are well characterised for manufacturing and batch release. This characterisation includes their size and size distribution. For virus development and production, it is important to know the virus concentration at different stages of the process, to optimise the clone used and the production yields. Malvern Panalytical has announced a number of webinars and seminars occurring throughout August and September. Malvern Panalytical has announced a wide range of upcoming webinars throughout July, including ‘Enter a New Dimension of X-Ray Diffraction Analysis’ and ‘Applications of Light Scattering and Intrinsic Viscosity Detectors with Size Exclusion Chromatography SEC in Characterising Biopharmaceutical and Other Polymers’. To register for any of these webinars, please either make an enquiry using the form on this page or visit www.malvernpanalytical.com/en/learn/events-and-training/webinars. This year’s European Powder Diffraction Conference (EPDIC16) is the stage for Malvern Panalytical’s new Empyrean platform, an instrument that redefines the concept of multipurpose X-ray diffraction. Malvern Panalytical has announced it will be hosting a number of seminars, including ‘One-on-One Breakfast Catch-up on the Latest Powder XRD’, ‘XRF Demonstration (Singapore)’ and ‘Pharma & Food Sector Seminar’. Malvern Panalytical has announced some key webinars taking place this month, including ‘A Basic Introduction to Rheology and Rheometry – Part Two, Viscoelectricity’ and ‘Enter a New Dimension of X-ray Diffraction Analysis’. To register for either of these events, please make an enquiry using the form on this page, or visit www.malvernpanalytical.com/en/learn/events-and-training. Malvern Panalytical has introduced its new Zetasizer® Pro and Ultra systems. Malvern Panalytical has announced a series of webinars taking place in May, including ‘The Live Launch of the New Zetasizer Pro and Zetasizer Ultra’, ‘A Basic Introduction to Rheology and Rheometry PART 1 – Viscosity’, ‘Enlightening the Fcab-antigen Interaction via X-ray Crystallography & Solution Studies’, ‘Get the best of both worlds: Coupling advanced multi-detection with UPLC for faster and more detailed polymer analysis’, and ‘Collecting X-ray Powder Diffraction Data: How to Choose the Best Configuration and Measurement Parameters’. Malvern Panalytical has announced three webinars in April: ‘X-ray Characterisation of Catalysts’, ‘Get the Best of Both Worlds’, and ‘TerraSpec® Halo Best Practices, Tips & Tricks’. Malvern Panalytical has announced the Morphologi range, consisting of Morphologi 4 and Morphologi 4-ID. Expert engineers and scientists at Malvern Panalytical constantly innovate through fundamental research and product development to defy the challenges that face our customers. Malvern has announced it will be holding a new webinar to explain the use of electrophoretic light scattering (ELS) to measure the electrophoretic mobility of particles or molecules in a solution. Malvern Panalytical’s new Epsilon 4 can be used to determine the chemical composition of all kinds of material. Sometimes referred to as photon correlation spectroscopy or quasi-elastic light scattering, dynamic light scattering (DLS) is a technique classically used for measuring the size of particles typically in the sub-micron region, dispersed in a liquid. Malvern Panalytical has announced a new webinar ‘Characterising Liposome Formation, Structure and Stability with Complementary Techniques’ that will take place this month. Malvern is hosting a webinar to provide an overview of the nanoparticle characterization platform NanoSight NS300. Detailed particle characterisation, including shape and size analysis and chemical identification, enables thorough understanding of drug formulations. Supplier of analytical X-ray instrumentation and software PANalytical has announced the introduction of a new Epsilon 1 X-ray fluorescence (XRF) spectrometer. A new webinar by Malvern evaluates and discusses size-exclusion chromatography (SEC) data to see the impact of different formulations on monoclonal antibodies and biosimilar molecules. Malvern has announced two upcoming webinars this month: Differential scanning calorimetry (robust and powerful physical characterisation of therapeutic protein products) and Cement (composition, structure, and fineness - we are stronger together!). Packing density and flow behaviour of metal powders has an effect on manufacturing efficiency of powder bed additives. Malvern has announced it will be unveiling its new protein stability characterisation product for regulated environments MicroCal PEAQ-DSC in an upcoming webinar. Malvern has announced that it will be presenting a webinar on the basic principles of particle size analysis. Malvern has announced it will present a webinar discussing the particle tracking analysis (PTA) method (ISO19430) and what it means for nanoparticle measurements. If you are attending Pittcon this year, why not register for Malvern's short courses, which are taught by recognised characterisation experts. 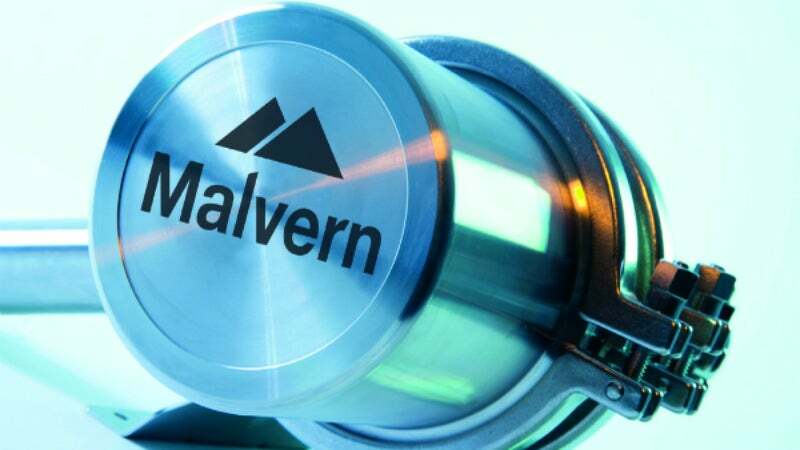 Malvern has announced it will be hosting a webinar about the use of laser diffraction as a technique in characterising nebulisers and how it is helpful in understanding the delivery of the drug product. Malvern has announced it will host a webinar to discuss how to measure zeta surface potential. Size exclusion chromatography (SEC) is a popular analytical technique for studying protein molecular weight, oligomeric state, aggregation, and conjugation. Malvern has announced it will host a live-panel webinar for the discussion of challenges submitted in an online form on the company's website. Malvern has announced it will be hosting a webinar discussing gel permeation chromatography (GPC), which is also known as size exclusion chromatography (SEC). Malvern has announced its latest webinar discussing the types of technologies used for analysing particulates in injectable drugs. Advancements in portable electronic devices such as mobile phones and laptops has increased demand for advances in battery technology. Malvern has announced it will host a webinar discussing the use of a diffusion interaction parameter (kD) measurement for the Taylor dispersion analysis in early stages of development. Malvern will be hosting a webinar to discuss the rheological requirements of paintings and coatings, as well as how they can be measured using a rotational rheometer. Malvern has announced it will be hosting a webinar to showcase new measurer NanoSight NS3000, which uses Nanoparticle Tracking Analysis (NTA). Cosmetics, paints, inks, paper, drug delivery, personal care, food or intra-lipid emulsions are made up of multi component chemistries. The food and drug administration (FDA) has used Malvern's Morphologi G3-ID system to generate key data for the approval of the first generic nasal spray containing mometasone furoate. Malvern is proud to announce they will be hosting a webinar on 8 March at 10:30AM EDT. Researchers working on the European Metrology Research Project NanoChOp (Chemical and Optical Characterisation of Nanomaterials in Biological Systems), funded by EURAMET, have concluded the NanoSight Nanoparticle Tracking Analysis system offers a unique insight into the behaviour of nanoparticles in biological systems. Malvern has highlighted its ongoing commitment to extending and supporting the application of NanoSight, a nanoparticle characterisation technology with unique capabilities, by releasing new software and expanding the global technical specialist team. Malvern Instruments and Bio-Rad from Hercules, California, are collaborating to deliver new analytical tools for the rapid identification of unknown particles. Particle Characterization Laboratories director William Bernt has highlighted the impact of adding a Malvern NanoSight nanoparticle tracking analysis (NTA) system to the toolkit for nanoparticles. New tools from Malvern that address specific analytical challenges in biopharma development will take centre stage at this year's AAPS Annual Meeting and Exposition, in Orlando, US. Insight from CP Kelco, a global leader in the specialty hydrocolloids market, provides a blueprint for the intelligent, cost-efficient deployment of gel permeation/size exclusion chromatography (GPC/SEC) in biopolymer manufacture. Malvern has opened a new biopharmaceutical applications laboratory in San Diego. Malvern Instruments has launched an improved rSolution platform on their Kinexus rotational rheometer. Researchers in the department of Chemical and Biomolecular Engineering at Ohio State University, Columbus, Ohio, US, are using Malvern's NanoSight nanoparticle tracking analysis (NTA) to study extracellular vesicle yields from different cell culture lines. Malvern has launched a new gel permeation / size exclusion chromatography (GPC / SEC) platform, which delivers high performance and productivity for analytical laboratories. Malvern Instruments will showcase a new chromatography system and detectors at Pittcon 2015 on 8-12 March in New Orleans, US. A new whitepaper from Malvern Instruments on oral solid dose (OSD) deformulation demonstrates how the analytical technique of morphologically directed Raman spectroscopy (MDRS) can be used to accelerate development of generic products to a successful conclusion. Malvern Instruments product development manager for Process Systems Alon Vaisman will speak about two different analytical techniques and their applications, as part of the particle characterisation session at the 2015 International Forum on Process Analytical Technology and Quality by Design (IFPAC) annual meeting. Malvern Instruments has published a new application note examining the use of NanoSight Nanoparticle Tracking Analysis (NTA) technology in the study of extracellular vesicles. 'Extending the boundaries of QbD', a new whitepaper explores the application of Quality by Design (QbD) principles to the development of analytical instrumentation and its benefits. Malvern Instruments has released new guidance on using automated image analysis to detect and quantify agglomerates. Malvern Instruments is attending the American Association of Pharmaceutical Scientists (AAPS) Annual Meeting and Exposition at San Diego Convention Center in San Diego. Malvern Instruments has released new 'third anniversary' accessories for the Mastersizer 3000, helping to reduce the time and cost of developing and validating robust methods for pharmaceutical particle size analysis. The cross-disciplinary capabilities of Malvern Instruments' technology are being fully exploited at Queen Mary University in London, UK. Malvern Instruments applications manager Dr Alan Rawle will give a plenary lecture at the Particulate Systems Analysis (PSA) 2014 conference and exhibition, organised by the Royal Society of Chemistry's Particle Characterisation Group. Researchers at The School of Freshwater Science, University of Wisconsin-Milwaukee, US, are using NanoSight Nanoparticle Tracking Analysis (NTA) from Malvern Instruments to investigate the effects of nanoparticle contaminants on freshwater organisms. The new Zetasizer Helix from Malvern Instruments enables the detailed study of mechanisms of protein aggregation and is a powerful tool for early stage biopharmaceutical development. Malvern Instruments Ltd. (Malvern, UK) has announced that it has entered into an agreement with GE Healthcare Life Sciences to acquire the company's MicroCal microcalorimetry business. Researchers within the the Departement Environnement et Agro-biotechnologies (EVA) of the Centre de Recherche Public - Gabriel Lippmann, Luxembourg, are using the nanoparticle tracking analysis (NTA) technique for the characterisation of nanoparticles within their toxicological studies. The new Zetasizer NanoSampler from Malvern Instruments is a versatile, compact, fully automated sample delivery system for the Zetasizer Nano, the most widely used system for nanoparticle and colloid characterisation. Malvern Instruments reports on the publication of the 1,000th peer-reviewed paper to cite the company's NanoSight Nanoparticle Tracking Analysis, NTA. Entitled 'Fumed Silica Nanoparticle Mediated Biomimicry for Optimal Cell-Material Interactions for Artificial Organ Development', it was authored by the research team of professor Alexander Seifalian from University College London. Dr Alan Rawle, applications manager for Malvern Instruments, has been invited to speak as part of the Brian Scarlett Memorial Session at the 7th World Congress for Particle Technology (WCPT 7), which takes place in Beijing, China, from 19-22 May. Malvern Instruments has acquired Wiltshire-based NanoSight Ltd, specialists in technology and instruments that are used worldwide to measure the size and other characteristics of nano-sized materials.